Camera by Jeremy Salig, Borja Alvarez Ramirez, Joe Weldon, Nic Blair, Kat Suarez, Zorikh Lequidre, Phil Fiumano, Leonard Schwarz. “Redemption” follows the story of a man on his journey from the underground mixed wrestling scene to the world of submission grappling as a legitimate martial art. It features a diverse cast of wrestlers, grapplers, and martial artists in a story of athletic competition and personal growth. The diversity of the cast inspired the filmmaker to place the story in a fictional world where rival teams of grapplers, one a legit martial arts school, the other a gang of underground fighters, meet in an annual tournament. At this tournament, the main character tries to redeem himself by facing his adversary, a female wrestler who had beaten him in a popular underground video. Submission grappling is the next hot combat sport, and this movie is the first attempt we know of to use the physical language of grappling, wrestling, jiu jitsu, judo, and other grappling arts as a storytelling medium. The cast includes veteran champion martial artists, up-and-coming mma fighters, pro wrestlers, recreational grapplers, and real-life underground male and female wrestlers. Together they combine to make an energetic, charismatic cast that truly reflects the diversity of New York City and the full range of the wrestling/grappling/martial arts community. The main message of the movie is that redemption is about taking everything that makes you what you are you are, cashing it in, and finding out what you are worth. This is what happens in athletic competition. To get the most out of it, you have to work hard and have fun. Too many people don't work hard enough, or work hard and don't have fun, or have fun and don't work hard. Those people will never advance as far as the could. The unspoken subtext is how sports are about having fun and trying to be the best, and when you are having fun and trying to be the best, gender doesn't matter. I want this movie to inspire people to work hard, have fun, and maximize their true value. Click here to see a list of movies that have inspired and informed this project. We had about 40% of this film "in the can" when the departure of two lead actors forced us to re-shoot the whole movie. But that's OK. That footage is now considered "test shoots," and the re-casting and re-shooting has produced a bigger and better movie. The project has become bigger now, outgrowing the modest ambitions of its beginnings. Much of the film has been shot in sequence. As this film chronicles a journey over time that Captain Zorikh takes, the physical training that Mr. Lequidre has undergone is reflected by the physical and personal development of the character. We have trained a co-ed team of submission grapplers to perform in the movie. The training process has been filmed and posted on the project's YouTube channel every week for promotion (http://www.youtube.com/user/CZRedemption). A second film will be made documenting it. Two movies for the price of one! The work with this team is the most exciting part of the project so far. Its members come from many different corners of the wrestling, grappling, martial arts, and acting worlds. Their interactions have inspired many subplots and viral marketing ideas that are being added to the project. The grappling team has been traveling to tournaments, parties, and conventions and is available for staged performances and demonstrations. The score for this movie is being composed by Ash Gray under the direction of Zorikh Lequidre. Ash is an extremely talented local musician who hails from Austin Texas. He has recorded several albums and performs regularly with his mostly-female band, Ash Gray and the Girls The sound evokes rockabilly, americana, country rock, punk, and classic blues. Ash has also contributed his song "I'm the Best Man for You" to the movie. Captain Zorikh, a musical entertainer himself, has written a new song, "I Can Go There" for this movie. It has been recorded with Ash Gray. Additional music is provided by Dr. Bronko Von Johnstein, a NYC-based rockabilly artist who has performed with Captain Zorikh as part of a combo known as The Death Star Repairmen. Making movies is fun and exciting but also takes a lot of work. Finding good people to work with and making investments in the right tools and items are a few of the factors that go in to making a great film. 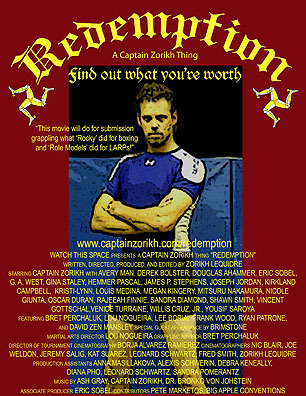 These movies will be submitted to film festivals, trailers and previews will be posted on YouTube, and sold through Amazon.com and the website http://www.captainzorikh.com/redemtion, and at comic book conventions. We have opportunities for product-placement sponsors, including grappling clothing, gyms and workout equipment, wrestling venues, and beverages. for more information, contact the producer at zorikh@juno.com. We are seeking sponsors, backers, and investors, and have a variety of options to accommodate whatever you can afford to contribute. Contact the producer at zorikh@juno.com or use the button below to donate safely and anonymously.